As some of you may remember... I joined the "gym" last March. It isn't really a gym. It is a very nice, 25 meter length, indoor swimming pool made for walkers, not really for lap swimming or for children playing. I don't say much about my swimming because I was taught that if you can't say something nice, then don't say anything at all. I decided not to complain about my swimming but I really don't much like it... The pool is nice, it isn't far away, but I guess I just don't like doing exercise in general. "Grumble, grumble, complain, complain. Am I going to the swimming pool today? I guess I am... I don't have a great excuse not to." Happily, I can only fit one or two swimming sessions into my week. Well, better than nothing! But still... I felt like a hamster going back and forth doing lap after lap, wearing myself out just splashing away. "Oh good. I've done 30 laps. I am out of here!" There must be some way to get more enjoyment out of swimming than the way I'm doing it. I went to the Internet hoping to find a swimming schedule or motivating lap log or something. 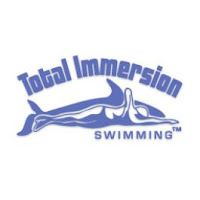 Instead I found a website called Total Immersion. Hmm. Interesting. It talked about a whole new way of swimming... without wearing yourself out... without worrying about counting laps. "Swim like a fish... Gracefully, effortlessly, beautifully." Yes? Well, I've always known how to swim. (Southern California girl with a swimming pool in her family's backyard.) And remember, I HAD been swimming about 30 laps each time I went to the pool. But since I've been reading my book, I've gone back to level one and am trying to learn to "Balance in the water" and "Lie on your lungs". New phrases and new techniques. I swim on my side trying to "Pierce the water". More often I sink. As the drills progress, other techniques are added. "Core propulsion" "Two beat kick". I sputter and get confused and come up coughing. The other day a man stopped me and asked me WHAT I was doing? "You are obviously trying to do something. I've been watching you." I explained the theory as well as I could... remember though, I am a bit confused myself. And last week when I was trying to coordinate the timing of breathing and arm recovery, someone else stopped me too. "Did you hurt your shoulder? You've been swimming here quite awhile but recently you seem a bit awkward and jerky." Obviously I haven't mastered the swimming beautifully part yet. One of these days the life guard may have to save me.